Cambodia's Ministry of Mines and Energy has banned all sales and exports of sand to other countries. For years, the principal customer of Cambodia's sand exports has been Singapore, which has used the sand to reclaim land along its coasts. Using land reclamation, Singapore has expanded its landmass by more than 20% since its independence in 1965. During the same period, Singapore's population tripled. The new decree, issued on July 10, bans all exports of "construction sand and mud sand" from southwestern Koh Kong province to overseas but stops short of outlawing domestic sales. Other southeast Asian countries, including Vietnam, Indonesia and Malaysia, have implemented bans in the past. Environmental groups have been pressing the government to stop the export of sand, saying the digging and dredging has had a serious impact on coastal ecosystems and surrounding land. In one Cambodian district where sand dredging had been taking place, nearly 200 people last month held a protest against the sand dredging. 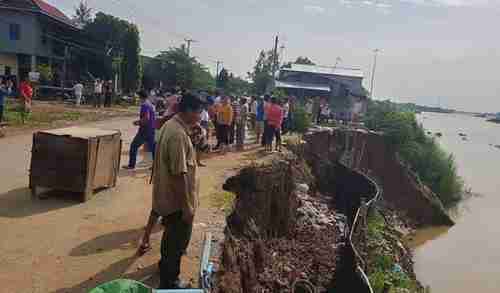 They called on authorities to take action after nine homes collapsed into the river, as a result of the dredging. Cambodia had already suspended sand exports in November of last year, because of a corruption scandal. Singapore claims that it had imported 72.2 million tonnes of sand between 2007 and 2015, the Cambodian government officials said that only 16 million tonnes had been sent. In money terms, the UN said that Cambodia had exported $752 million in sand, but Cambodia claimed it was only $5 million worth of sand. "Sand and gravel represent the highest volume of raw material used on earth after water. Their use greatly exceeds natural renewal rates. Moreover, the amount being mined is increasing exponentially, mainly as a result of rapid economic growth in Asia. ...Negative effects on the environment are unequivocal and are occurring around the world. The problem is now so serious that the existence of river ecosystems is threatened in a number of locations." Sand and gravel are used for land reclamation, as in the case of Singapore, but for a lot of other things as well. They're the main constituents in concrete and asphalt that are used in building constructions, roads, and many other structures. A typical American house requires more than two hundred tons of sand, gravel, and crushed stone for the foundation, basement, garage, and driveway, as well as the section of street in front of it. A mile long highway requires 38,000 tons. In the last four years, China has used as much concrete as the United States in one century, according to Pascal Peduzzi, the author of the UN report quoted above. In India, sand is so scarce that markets for it are dominated by criminal "sand mafias." "Five countries � China (58%), India (6.75%), the United States (2%), Brazil and Turkey � produce 70% of the world�s cement. However, cement demand by China has increased exponentially by 437.5% in 20 years, while use in the rest of the world increased by 59.8%. Each Chinese citizen is currently using 6.6 times more cement than a U.S. citizen. Demand continues to increase with new infrastructure and renewal of existing infrastructure (roads, bridges, dams, houses) � all dependent on the availability of aggregates." UN's Peduzzi says that Lake Poyang, for example, is China's biggest freshwater lake but also its biggest source of sand, with estimates of over 230 million cubic meters of sand extracted each year. This is lowering the lake's water level, potentially damaging surrounding wetlands and affecting the flow of nearby rivers, including the Yangtze.